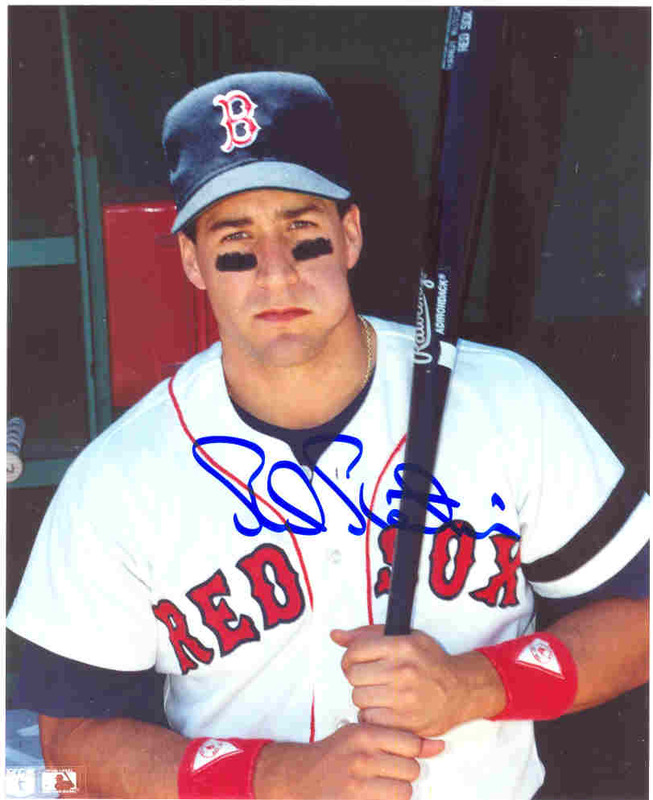 Phil Plantier: Coming off of a decent rookie year with the Boston Red Sox in 1992, Plantier took his place as a left fielder in the Padres Lineup with Derek Bell in CF and Tony Gwynn in Right Field for the 1993 season. The team also had Gary Sheffield and Fred McGriff featured in the lineup. Plantier hit 34 HRs and drove in 100 RBI in just 467 AB for the club. His HRs per AB (13.6) were 2nd in the league in this category to Barry Bonds. Plantier was not that bad as an outfielder with 13 assists that year-which placed him 3rd in the league. Even though Plantier only hit .240 in 1993, his slugging percentage was .509. In 1994, Plantier put up decent power numbers with 18 HRs and 41 RBI in 341 AB, however he struggled with a .220 AVG. The season was disrupted by the player strike and Phil Plantier was never the same after because the Padres had traded for Ken Caminiti. 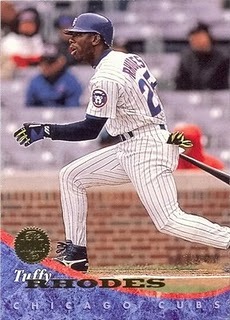 He bounced around as a reserve outfielder for a few years before retiring in 1998. For one year and a half years he captivated the baseball world with towering shots to the bleacher seats. 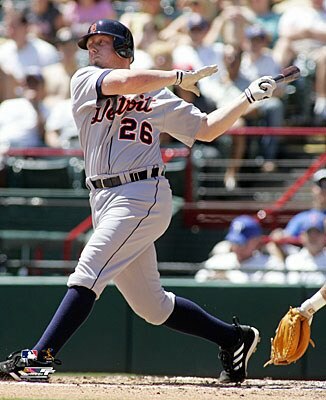 Chris Shelton: Shelton hit 9 HRS in the first 13 games of the 2006 year for the Tigers. It was the fastest HR pace ever set in the American League to start a year. He was player of the week in the AL and the toast of Detroit. He even had a soda pop named after him and he was being hailed the savior of the struggling franchise. Funny enough, that team went to the 2006 World Series and without him on the roster. Shelton was not part of that run because he only hit 7 HRs in the next 102 games and was sent back to the Minor Leagues at the Trade Deadline to make roster space for 1B Sean Casey. During the 1st 5 games of the 2006 season, Shelton had 4-3 hit games and a 2 hit game to be hitting .700 (14-20). After the 13 game mark, Shelton featured an OPS of 1.71. After 2006, Shelton only ever hit 2 homers more in the MLB. Tuffy Rhodes is one of 12 players to homer 3 times on Opening Day. He did this off of Dwight Gooden. The Cubs fans at Wrigley thought they were witnessing a superstar in the making, Tuffy Rhodes would play out the season in Chicago before never returning to the MLB ever again. Tuffy Rhodes: After the 1994 season, Tuffy Rhodes was granted Free Agency. Despite his big 3 HR game on Opening day, Tuffy only hit 5 more HRs for the rest of his MLB Career. Rhodes signed with a Japanese ball club-the Kintestu Buffaloes. He would go on to hit 474 HRs in the NPB, good for 1st ALL-Time as a foreign player and 10th overall in their league. In 2001, Rhodes tied Sadahuro Oh’s record of 55 Home Runs for one single year. With time left in the season, the Japanese pitchers intentionally walked him for the rest of the year. A Bush League move on their part to protect Oh’s record for more than a week. I was so mad when I heard about this. Where is the respect for the game? I mean when Ichiro Suzuki was at 256 hits, there would have been a full scale media circus had opposing pitchers not tried to pitch to him in breaking George Sisler’s record mark of 257 hits in one year. I have just become so upset about this again after 10 years, I am going to dedicate another article to the biggest Bush League Maneuver’s of All Time in Professional Baseball. I think this will rank right up there! Rhodes tried a comeback in the Reds Minor League System in 2006 before returning to Japan for three more seasons from 2007 to his final season in 2009. When Don Mattingly went out for the season with a back injury in 1990, Kevin Maas had the chance of a lifetime in playing 1st base for the Bronx Bombers. Kevin Maas: For about a half of one year, the Yankees fans thought they were seeing another legend take over for a great baseball player due to injury. 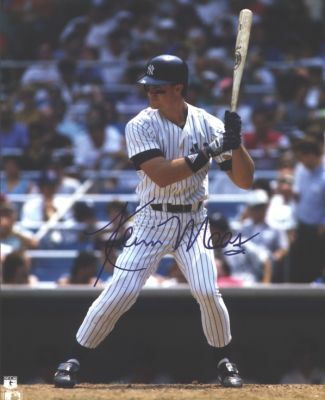 Kevin Maas came up on June.29.1990 and smashed a Major League Record 10 HRs in his first 72 AB, then broke another record when he hit 15 HRs in his 1st 110 AB. While he slowed down in the last 2 months of the season, he still finished in 2nd for Rookie of the Year voting with 21 HRs and 41 RBI in only 79 games. The next year Maas started off as the permanent DH, however he struggled to make contact hitting only .220. Maas still managed 23 HRs and 63 RBI in 500 AB. In 1992, he fell out of favor with new manager Buck Showalter. The Yankees had Danny Tartabull as their new primary DH. Maas hit 11 HRs in just 286 AB. 1993 saw him hit 9 HRs in 151 AB. The Yankees decided to release him before the 1994 season. Maas only hit one other HR in his MLB Career. In today’s game, he would be given every chance to hit with that kind of power. He hit a HR for ever 19.2 AB in his career, this would make him a 30-35 HR guy every year. Kevin Maas plays in the Alumni Games now for the Yankees. Jack Cust: The story might not be over for Jack Cust. He was recently released by the Yankees. At age 33, someone might give him another shot to return to form. Cust bounced around the MLB until he signed with the Oakland Athletics. In what has become a great destination for failed power hitting prospects, Cust rose to the challenge. After a May callup in 2007, Cust hit 6 HRs in his 1st 7 games and was named Co-Player of the week in the AL. Cust hit 26 HRs and added 82 RBI in just 390 AB by the end of the year. He also walked 105 times and struck out and AL Most 164 times in just 124 games. For the next 2 years, Cust hit 58 HRs, walked 204 times (led the league in 2008) and led the league for both years in striking out. He struck out 382 times. After 2009, he has not played a full season since and is currently on the open market. We at the Reports, call him a ‘3TO.’ This short for ‘3 True Outs: A Strikeout, A Homer or a Walk.’ Adam Dunn is a more prolific version of Cust. Somebody should think about giving this man a shot. He had a .381 OBP/.457 SLG and .839 OPS as an Athletics player up until 2010, this was despite playing half of his games at the ‘pitcher friendly’-o.co Coliseum. Forget his stint as a Mariner, everyone struggles hitting there. Out of the 5 guys listed here, Cust has had the best career in the MLB. As someone who grabbed my attention as a fan in 2007, I hope he gets another crack at the MLB! 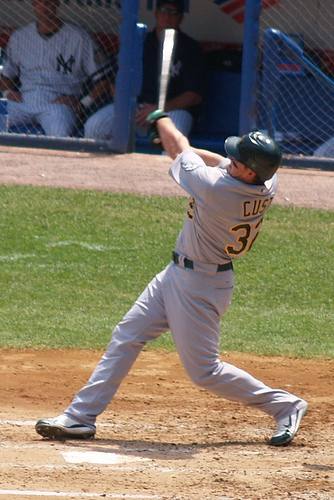 Jack Cust quickly became one of my favorite players-when he came bursting onto the scene in 2007 for the Oakland Athletics. In the first game I ever attended at Comerica Park, Cust hit a grand slam and a 3 run double in his 1st 2 At Bats. I bellowed in praise from the concourse (between two pillars to not be seen) amongst 40000 Tiger fans. 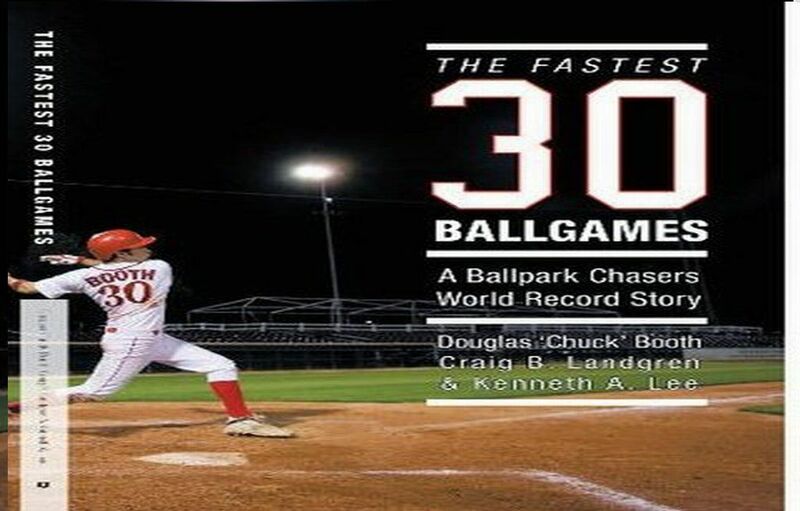 Posted on August 15, 2012, in The Rest: Everything Baseball and tagged 1994 strike, 3TO, adam dunn, barry bonds, billy beane, bob hamelin, boston red sox, buck showalter, chicago cubs, chris shelton, Chuck Booth. fastest 30 ballgames, danny tartabull, Derek Bell, don mattingly, Dwight Gooden, gary sheffield, jack cust, ken caminiti, kevin maas, kintetsu buffaloes, mlb, new york yankees, npb, oakland athletics, phil plantier, Rick Ankiel, rookie of the year, sadaharu oh, sam fuld, san diego padres, sean casey, seattle mariners, tony gwynn, tuffy rhodes, wrigley field. Bookmark the permalink. 5 Comments. Questioning how Jack Cust qualifies as a one-hit wonder. Are you trying to say that he was good for long enough not to be equated into that category?